To facilitate a safe and reliable liquid nitrogen handling, cryolab series containers are ideal with range of storage capacities starting from 2 litres to 50 litres and array of accessories. 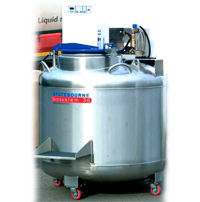 These low pressure LN2 dewars are constructed of high quality stainless steel to safely withstand the harshest work environment while offering low evaporation losses. 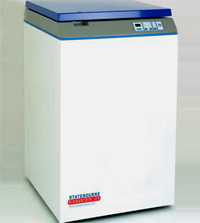 This high performance LN2 storage containers are available in sizes ranging from 30 to 300 litres. The BioRack series of refrigerators offer very efficient storage solutions for bulk quantities of cryovials. These containers can accommodate racking systems and enable the storage of large quantities of biological material over extended periods of time. This model is available in four sizes – 750, 3000,4800 and 6000 x 2ml cryovial capacities. » Have wider neck diameters and hence can store larger quantities of biological materials. » They have narrower necks and hence outstanding thermal efficiency. This containers are specially designed for shipping samples in ultra cold conditions without the danger of releasing liquid nitrogen during transit. This DRY SHIPPERS contains a special cryo-absorbant which ensures the samples placed inside are as close as possible to liquid nitrogen storage temperature even though they are not immersed in liquid nitrogen. This fully microprocessor controlled and security back up system are designed to provide frequent access to the users with rapid specimen storage and retrievel., with storage capacity of minimum 10250 numbers of 2 ml. vials. Available as 3 models : biosystem 12, 24 and 50. 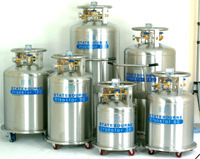 This bulk storage cryo containers are designed to maximize economic operation with the lowest possible consumption of liquid nitrogen. A liquid proof rotating internal container allows liquid levels to be controlled safely within the annular space between the drum and the container wall, generating near isothermal temperature mapping throughout the storage space. Available as 3 models: biosystem archive 36, 55 and 80. These standard wide neck refrigerators are low cost alternatives to biosysten access series. 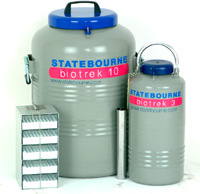 These are available as 3 models: biostor 5, 12 and 24. These exceptionally stainless steel constructed dewars are ideal for use as cold traps, for immersion or simply for temporary liquid storage. Available as mini and maxi range with capacities from 0.5 to 80 litres.